We take a look at the rather positive trading update from Mustek (MST), in which it states profits are expected to be between 15% and 25% higher than the previous period. Founded by David Kan in 1987, the Mustek Limited Group was listed on the Johannesburg Securities Exchange in 1997, and currently comprises the active operations of Mustek and Rectron. This Profile deals exclusively with Mustek, currently the largest assembler and supplier of personal computers in South Africa. Mustek aims to be South Africa’s ICT Supplier of Choice, something it constantly strives for through an approachable, “can do’ attitude when assisting its resellers with product specification and solution formulation, as well as superior technical expertise, evidenced by the high level of technical support and assistance afforded to its resellers. Mustek combines the best of local assembly capabilities with the multinational product portfolio by affording its customers a choice of the renowned Mecer brand of computing equipment and a broad range of top-tier ICT brands which address every level of the technology stack. This strategy enables Mustek to offer its customers a perfect match for their technology needs, whether driven by configuration and customisation requirements (as is the case with the Mecer brand), or through tried and trusted best industry practices and competitive pricing (as is the case with the multinational brands which Mustek distributes). Mustek’s position in the South African market has been built on an unwaivering commitment to customer satisfaction, the development of some of the most sought-after relationships in the international ICT market, adherence to the most stringent international quality standards and benchmarks, and a staffing policy that sees it retaining staff that are trained and accredited to the highest possible level. All of this culminates in Mustek being one of the easiest and most professional distributors for South African resellers to do business with. In terms of paragraph 3.4(b)(i) of the JSE Limited’s Listings Requirements, companies are required to publish a trading statement as soon as they are reasonably certain that the financial results for the current reporting period will differ by at least 20% when compared to the previous corresponding period. In light of the above, Mustek’s shareholders are informed that, for the six months ended 31 December 2018, Mustek’s headline earnings per share is expected to be between 15% and 25% higher than the previous corresponding period at between 66,79 cents and 72,60 cents (31 December 2017: 58,08 cents). 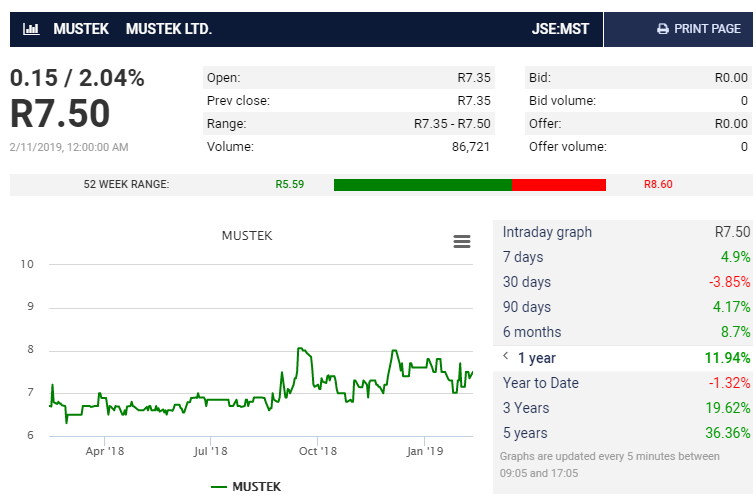 The image below, taken from Moneyweb, shows Mustek's share price performance over the last 12 months as well as provides a summary of the performance of the company's shares over the last 3 years and 5 years. Mustek's share price has gone up by 11.94% during the last 12 months, which is more than what most stocks listed on the JSE can say. As we showed the other day, the total JSE market capital of all shares listed on it declined by 15.6% over the last year. So investors in MST should be happy. The only problem we have with them is the fact that the shares are extremely illiquid and doesnt trade regularly. So it is hard to buy or sell the shares (without seeing big gaps between bid and offers).